Vietnam passed new mandatory legislation for food fortification in January 2016. UNICEF and IGN have been supporting the government and national stakeholders to implement the legislation, by organizing a dissemination meeting prior to the effective date and a monitoring visit shortly after it became effective. Unfortunately, the monitoring visit found that the law was not yet being fully enforced by the government. UNICEF and IGN therefore collaborated with the Union of Science and Technology Associations (VUSTA) to advocate for stronger implementation of the mandatory salt iodization Decree, hoping to reach the ears of policy makers and high-level leaders of Vietnam. National stakeholders in Vietnam have been struggling to implement the new Decree. A key challenge for iodized salt is the unwillingness of fish sauce producers to use iodized salt to produce their products, due to concerns about negative effects on their final products, and the higher cost of iodized salt compared to non-iodized salt. While compliance of salt producers in producing iodized salt is significantly better, some have raised concerns about reliable potassium iodate suppliers. In addition, the Government has been significantly delayed in providing guidance on implementation of the Decree, updating technical requirements, and coordinating between relevant stakeholders. 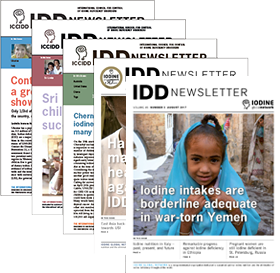 "Evidence has already piled up from Cambodia, the Philippines and other countries that voluntary iodine fortification does not work. Mandatory salt iodization is the only solution to improve iodine status of Vietnamese without any behavior change." UNICEF and IGN recognized the lack of government commitment and internal coordination. Strong supporters of the Government’s salt iodization program since the first IDDC program in Vietnam in the 90s, UNICEF and IGN in November 2017 partnered with VUSTA – a socio-political network of non-governmental science and technology organizations in Vietnam, with close links to the National Assembly. On 14th December 2017, under this partnership, UNICEF and VUSTA co-hosted an advocacy workshop on “Strengthening the implementation of Decree 09/2016/ND-CP on food fortification.” The workshop aimed to increase awareness of relevant stakeholders on the necessity of salt iodization, especially mandating the use of iodized salt in food processing, thus pushing for stronger enforcement of Decree 09. Importantly, this leveraged the opportunity of VUSTA, with members from National Assembly, to champion and advocate for effective implementation of Decree 09. More than 70 representatives from the National Assembly, line ministries, civil organizations, research institutes, NGOs, private sector, and media attended the workshop. Vice-President of VUSTA, Mr. Nghiem Vu Khai (making his opening remarks) and Ms. Yoshimi Nishino, Deputy Representative UNICEF Vietnam in the opening session of the VUSTA meeting. VUSTA opened the meeting and informative presentations from IGN's Regional Coordinator Karen Codling, the Legal Department of the Ministry of Health, and the Salt Department of the Ministry of Agriculture and Rural Development (which is responsible for both salt and fish sauce production), and a local researcher on micronutrient deficiency among pregnant women, were delivered. In the discussion session, manufacturers of iodized salt in Vietnam and a fish sauce producer from Cambodia spoke about the need for enforcement to avoid unfair market completion and the 100% feasibility of using iodized salt in food processing, including fish sauce. Notably, beside the information about the process of iodized fish sauce production, the Cambodian fish sauce producer confirmed that all Cambodian fish sauce is made with iodized salt without any negative impacts. However, some stakeholders raised questions already answered, such as: Why did the legislation have to be mandatory? Why didn’t the government continue to provide free potassium iodate? And why wasn’t the implementation delayed allowing more preparation by the industry. In his closing remarks, Nghiem Vu Khai, the Vice President of VUSTA, re-emphasized the role of Vietnamese scientists in supporting the enforcement of Decree 09 by providing evidence and technical expertise to help company owners and technicians understand how to fortify salt with iodine. VUSTA declared its commitment to write to the National Assembly and Government to express its support of the implementation of Decree 09. Hopes are high that implementation of this important intervention in Vietnam will improve. Phuong Do Hong is the Nutrition Specialist in UNICEF. She focuses on social policy and was instrumental in getting the recent Food Fortification Decree passed but also legislation on protection of breastfeeding and child insurance. 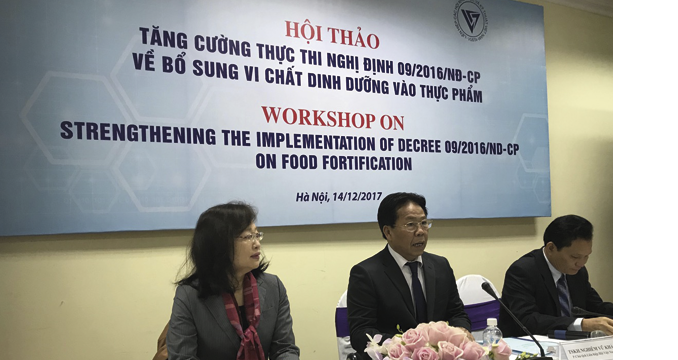 Vu Thi Thu Ha recently joined UNICEF as a Nutrition Policy consultant and is the focal point for implementation of the recently passed Food Fortification Decree. Previously she was with Alive and Thrive in Vietnam.